Dictionary.com is begging to be placed on the crowdsourced Android Blacklist. 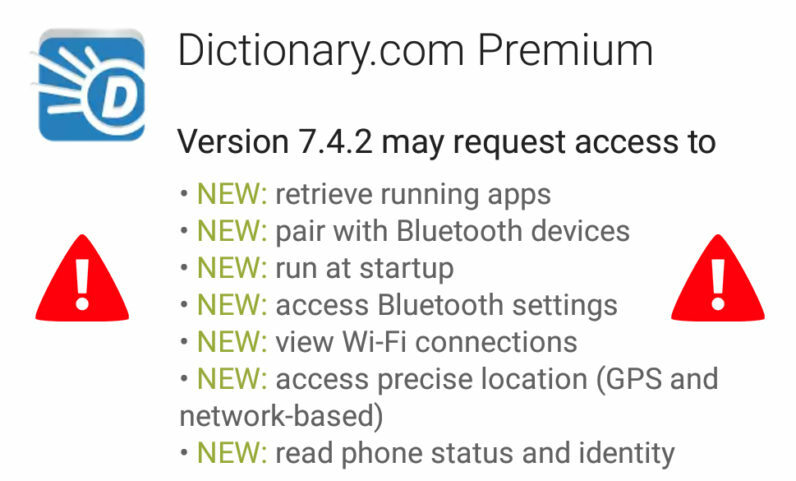 Following incremental updates to both its freemium and premium apps, the popular glossary solution has discreetly added seven intrusive new permissions. The privacy-unfriendly move was spotted by Reddit sleuth Snotbot who took to the Android subreddit to warn the rest of the community against the changes. The newly added permissions stipulate that, among other things, Dictionary.com has now been authorized to access your precise location (GPS and network-based if enabled), read your phone status and ID, retrieve running apps, pair with Bluetooth devices and view your Wi-Fi connections. Interestingly, a brief look at its terms of service page reveals the privacy changes were first introduced on July 17 – a whole week before they were purportedly implemented in the mobile apps on July 24. Meanwhile, its premium counterpart hasn’t received any touch-ups since 2014. Another thing the company wildly mishandled was letting users know exactly why and how collected information will be used. The terms of services brush upon the fact that location data can be leveraged to offer better-tailored services, features and, naturally, advertising. There is one crucial factor though: Dictionary.com doesn’t really have any location-based functionalities. This mostly leaves us with advertising. And in case you’re wondering where all of that data will be going, Dictionary.com mentions various possibilities like sharing it with greedy service providers, thirsty advertisers and its parent company IAC Group. It could also use the data for legal matters – when appropriate or necessary. So should you find yourself uncomfortable with the idea to share your data usage to such extensive degree, you might want to look into switching to Merriam-Webster or Livio. We hear they’re both pretty good.